Work is hard; it always has been. What people tend to forget is, work has grown significantly easier over the last hundred years. After a “grueling” eight-hour day, we go home, complain about our bosses, coworkers, and any other annoyances that meet us at our places of business (when dealing with the public, some of these complaints can be warranted). The coal miners in Matewan, West Virginia, were not so lucky. In fact, it is due to their—and others like them—sacrifices, that people today can work reasonable jobs. 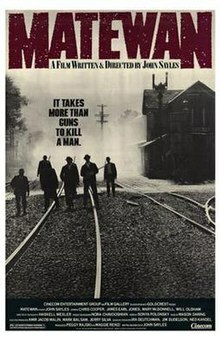 Those miners, as portrayed in director John Sayles’ Matewan, decided they had had enough of working endless hours for miniscule wages, especially when combined with the coal company’s refusal to reduce any of the dangers associated with the job. When Joe Kenehan (Chris Cooper), a pro-union man, arrives in town, his ideas about workers’ rights catch on with the miners. They struggle to organize, provoking lethal action from the powerful and ruthless men atop the Baldwin-Felts coal mining company, fueling a literal rich-keeping-the-lower-classes-down powder keg. Kenehan watches the fight from the train and the realization sets in he’s in for a tough go of it. When he reaches Matewan, he moves into a boarding house run by a miner’s widow named Elma Radnor (Mary McDonnell) and her teenage son, Danny (Will Oldham), a child laborer at the mine and also a promising preacher. That first night, Danny preaches at the local church about the need for a union and is shuffled off the altar by the head minister, an anti-union man played by Sayles himself. During this, Kenehan meets with a collection of miners who had loosely been trying to organize. While there, one of the new black men, Few Clothes (James Earl Jones), enters, wishing to be a part of the union. Despite the vehement antipathy shown toward Few Clothes by the white miners, Kenehan convinces them they will need everyone to stand up to coal company. Without workers, he explains, the company cannot excavate its product. Kenehan meets with the black miners and also the recently arrived Italian immigrants to persuade them to join with the other men. The men are unsure of what to do. Later, when the white miners learn of the blacks and Italians working night shifts behind their backs, they confront them on the hill. Ready for a fight, the white miners are then met with Baldwin-Felts men aiming rifles at them. To diffuse the situation, the night shift workers throw down their shovels and join the striking white miners. The next day, Hickey and Griggs, company men hired as muscle, arrive in town. They take up residence at the Radnor boarding house, displacing Kenehan, who graciously vacates his room to avoid any unnecessary fighting. Hickey and Griggs begin to break the union by evicting miners from company-owned houses. However, Police Chief Sid Hatfield (David Strathairn) refuses to allow such strong-armed tactics without any eviction notices, and deputizes each Matewan man to enforce his will against the company men. The striking union men move their families to a camp in the woods outside of town. Hickey and Griggs, along with other hired men, take shots at the camp at night, injuring some of the miners. The next day, they further try breaking the strikers by demanding all company-owned goods and food be returned. However, some hill people arrive in the camp. Saying they are unhappy with the noise the company men made the night before, they draw their weapons on Hickey, Griggs, and their lackeys and force them to leave. C.E. Lively, a company infiltrator, tries to drive a divide between Kenehan and the strikers by getting a local widow to accuse Kenehan of sexual assault. This greatly angers the men, who decide to kill Kenehan. After drawing the short straw, Few Clothes is elected to perform the duty. After bonding with him over a campfire, Few Clothes is conflicted and unsure of how Kenehan could have done such a thing. Just as Few Clothes builds the resolve to carry out his order, another miner enters the camp with the truth about Kenehan’s innocence, strengthening Joe’s message. After the Baldwin-Felts men murder a young miner, the powder keg is ready go blow. As company reinforcements arrive to fulfill the promise of evictions, Chief Hatfield begins shooting at the men. Kenehan rushes to try to stop the fight, wanting to prove the union’s goals can be accomplished peacefully, but is unsuccessful. The Baldwin-Felts men are all killed, as are several miners and townspeople. Danny and Mrs. Radnor find Kenehan at the train tracks, dead of a gunshot wound. In voiceover, an elderly Danny reveals the strikers never beat the company, and he worked the rest of his life in the mines. Matewan is a powerful film, especially given its historical relevance. In the years preceding the events of the movie, unions struggled to give workers around the nation some security and safety. Moving beyond historical accuracy, Matewan more than holds its own as a work of art. The acting, from the top billed Cooper on down, is phenomenal. Cooper’s turn as Kenehan feels like a classic film hero, but filtered through a nervous dread of impending collapse. Oldham, who in real life is a singer-songwriter who tours under the name Bonnie “Prince” Billy, uses his stage presence to great degree when delivering his sermons; his convictions would sway even the most pessimistic of audiences. You feel for these people as these injustices are performed against them, but Sayles does a great job of pulling back to expose their own prejudices and infighting with the immigrants and black workers. The fight outside the train at the film’s beginning prepares the audience to not give themselves over wholly to the strikers. However, as the film progresses, you begin to understand their feelings toward the black men are less about racism and more about their own lack of security in their positions in their jobs and world around them. And that understanding is the lesson that one should take from Matewan. Everyone deserves a fair shake, and if those in power refuse to give that fair shake, there can be grave consequences. Tindall, George B., and David E. Shi. America: A Narrative History. 8th ed. Vol. 2. New York: W.W. Norton &, 2010. Print.